Halli Sveinsson has grown up in the House of Svein, listening to the legends of the heroes as all his forefathers did. His is a peaceful society where the violence of the past has been outlawed and disputes are settled by the Council. But young Halli has never quite seemed to fit in with the others. For starters, he was not at all handsome or tall, like his attractive blond siblings. He's stumpy and swarthy, with a quick mind and aptitude for getting in trouble. The fate of the world is in the hands of detective of the supernatural R. F. Jackaby and his intrepid assistant, Abigail Rook. An evil king is turning ancient tensions into modern strife, using a blend of magic and technology to push Earth and the Otherworld into a mortal competition. 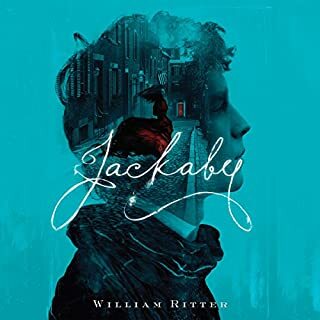 Jackaby and Abigail are caught in the middle as they continue to solve the daily mysteries of New Fiddleham, New England - like who's created the rend between the worlds, how to close it, and why zombies are appearing around town. As a massive outbreak of supernatural visitors baffles Scotland Yard and causes protests throughout London, Lockwood & Co. continue to demonstrate their effectiveness in exterminating spirits. Anthony Lockwood is dashing, George insightful, and Lucy dynamic, while the skull in the jar utters sardonic advice from the sidelines. There is a new spirit of openness in the team now that Lockwood has shared some of his childhood secrets, and Lucy is feeling more and more as if her true home is at Portland Row. It comes as a great shock, then, when Lockwood and George introduce her to an annoyingly perky and hyperefficient new assistant, Holly Munro. Meanwhile, there are reports of many new hauntings, including a house where bloody footprints are appearing and a department store full of strange sounds and shadowy figures. But ghosts seem to be the least of Lockwood & Co.'s concerns when assassins attack during a carnival in the center of the city. Can the team get past their personal issues to save the day on all fronts, or will bad feelings attract yet more trouble? This was right in line with the quality of the previous two. Not sure why each book has had a different reader. This reader is quite a bit different than the first two, but once you get used to her, there's lots to like. And the book, really, is the star. Creepy, compelling, completely annoyed that I can't read the next one yet. J.S. is going to throw us all for a loop, I think. I hope it's a nice, long series. 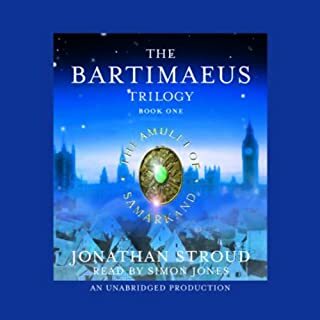 If you’ve listened to books by Jonathan Stroud before, how does this one compare? I think this is the best book in this series. Overall the story had a good momentum, lots of unpredictable moments, it has really scary parts where it's difficult to figure out whats happening (always good in a mystery), the supernatural elements are amped up (in a good way) and really add to the story and suspense. It was nice to see different factions working together, but in someways not enough character development on key people outside the group to be invested in them or their contributions. So sad to learn the bones were burned, and left wondering what that means for the future?? if anything?? However, what a missed opportunity to develop Lucy's back story and character in the scene where she goes home for her first visit since the series started by basically saying:" Lucy went home, didn't relate, left early. If there hadn't been great narration, this would have been the point where I stopped and re-wound because SOMETHING is missing! My last "what the Heck" moment came again at the end of the book, with another "cliff hanger" that is unnecessary. It didn't add suspense, it didn't make me pee my pants wanting more, it is irritating. What about Emily Bevan’s performance did you like? Ms. Bevan's narration has been the best of the three books, and was thoroughly enjoyable. She is able to convey subtle nuances with her lovely voice, and it is very much appreciated. I listen while cooking, and never got lost or had to re-wind. She elevated the story. The story was a wonderful sequel. The narrator handled the girl voices very well, but I didn't enjoy the handling of the boy voices especially George's. Wished we could have stayed with the previous narrator. The story is excellent but the reader is awful. She gives the character these awful voices which undermines the story. I listened to the first two books in the Lockwood & Co series which expertly and masterfully read. The first two books were absolutely wonderful and i was really looking forward to this third book. However, ms. Bevan gives strange voices to all the characters: she makes Lockwood sounds like an low class idiot, George a moron, Lucy an overly emotional immature and indecisive nitwit, and she gives the skull a shreiking and whiny voice which is simply annoying. I would love to listen to this story read by one of the two readers of the first and second book. Ms. Bevan's performance undermined the story such that it looses all the mystery and suspense of a good suspense thriller and ghost story. Such a shame for the author and the audience because the story is really quite good. 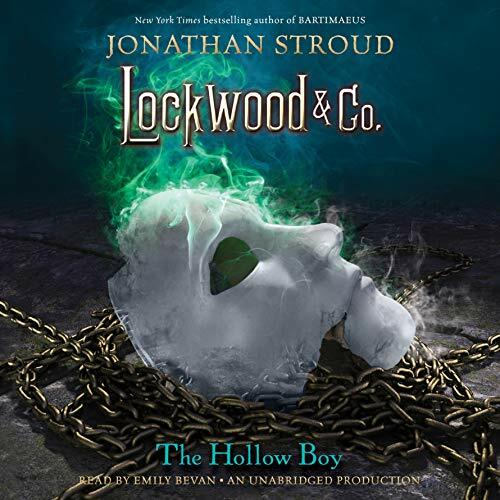 I remain a fan of Jonathon Stroud's work but reccomend that for book No3 in the Lockwood &Co series read it yourself. What other book might you compare The Hollow Boy to and why? the story is very good and compares to the first two books (which are really expertly read) but i couldn't get past the reader's abysmal performance. Would you be willing to try another one of Emily Bevan’s performances? Never- her performance ruined the story. Such a shame. If you could play editor, what scene or scenes would you have cut from The Hollow Boy? i liked the book- loathed the reader. 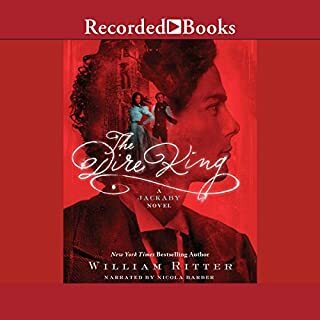 Please get someone else to read it, preferably one of the readers for the first two books in this series..
A new performer narrated this third book and to my ear had too mature a voice for the major characters. She did have a good range but I doubt I will pursue the series with this narrator. Didn't like the new narrator at first...mainly due to her male voice imitation. Felt it was too heavy. But after a while the story overcame it and in the end was satisfied. As always, Stroud presents YA fiction with superior writing to almost any of his competition in the genre. I didn't find that this addition to the series was at all off the mark, despite reviews to the contrary. 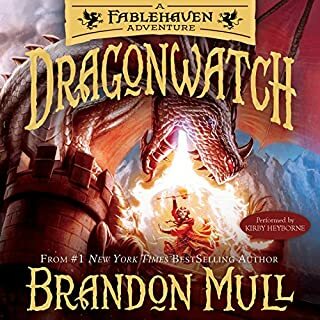 As this story is told from the perspective of a girl, I didn't find any of her Lockwood crushing out of place and would have in fact, found it kinda fake (and lacking) if she hadn't had a crush on him. This also makes her rivalry with the new girl a believable thing. She's an emotional character, so it makes complete sense. Addressing the meat of the story, the new ghost encounters are very exciting. As usual it's mildly hostile to Christianity, but nothing terribly bad (just a brief, mild incident earlier on in the novel). I really liked the introduction of new questions regarding Lucy and The Problem and am left wanting more. There is a bit of a cliffhanger at the end, but it was a good place to stop. I will be excited to read the next installment. Lastly, the narrator is just fine. She is definitely different than the first two but I didn't find her irritating or flat. She did a good job and her voices were easy to get used to. This book changes the tone of the Lockwood & Co. both because of a change in narrators and the writting. To start with the narrator - I think she pretty good and likely is giving us a more true northern working classes then Katie Lyons. I really hate swapping narrators unless it's a full cast or pair that do really long books. All that being said I did find her a touch harder to understand - that my fault not hers. The story: envy and girls having a long running emotional fight in the way of offices, schools and woman's groups --- well that what I read books to get away from not read about. This is book fulled melodrama of that nature. Yes I likely will finish the book but I not really pleased. I would say this is a little less scary then the previous book if for no other reason then there too much whining to really focus the reader mind on the ghosts. If you could sum up The Hollow Boy in three words, what would they be? She wasn't consistent with her voices and some of the voices she created for the characters were over the top and very distracting. I really didn't like the narration at all. 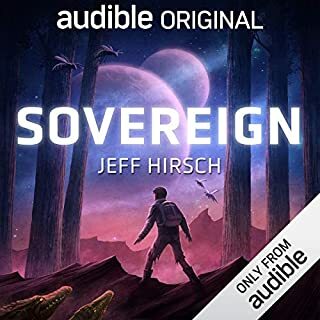 I almost didn't finish listening but it was checked out at the library. 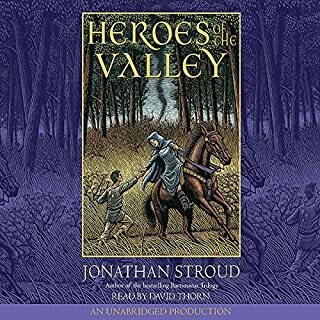 Jonathan Stroud writes great characters, and they sometimes overwhelm the story of the book. Not that one notices that much! His Bartemeus series is an example. The Djinn was so much fun that I rarely noticed the relatively shallow story line. Here too, the characters are so much fun that I rarely notice the story. The story writing style is exquisite, and while JS is no Raymond Chandler, he does have an excellent writing style. In the third book, the characters are back doing ghost hunting. A new character is introduced and there is tension between the new character and Lucy. We all move along and eventually more haunted mysteries are solved. There you go - that's most of the book (plus a cliffhanger ending). Not much of a story - but the style and each individual haunting is fascinating and I listened to the book flat in 2 days! The book is a definite upgrade on book 2, which I thought lagged a bit. So, overall, it's a worthwhile book and good addition, but I would really like JS to move the story forward as well. PS Can we bring back the previous narrator or someone else? Emily Bevan did an adequate job, but her pacing and pronunciation wasn't as fun as the previous ones. Maybe she was trying to be authentic, but pronouncing "skull" as "schaull" (heavy british accented), was just distracting.